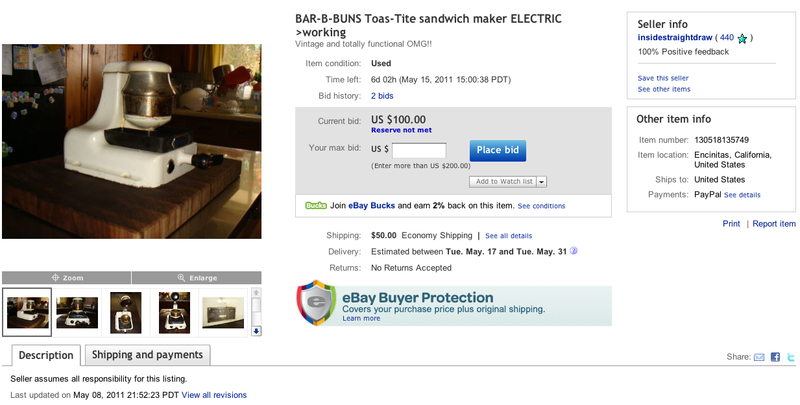 Then in May of this year, we saw another one appear on eBay but this time from Encinitas, CA. We grabbed photos and a screenshot right away but sadly we were out of town during the final stages of the bidding – something I still regret *sigh*. 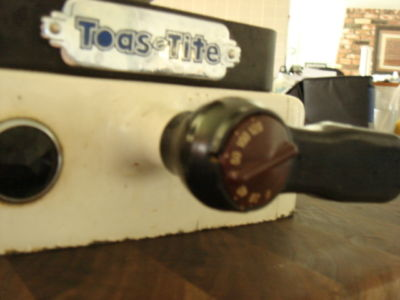 WOW here we go… an original, vintage and fully functional ELECTRIC Toas-Tite brand sandwich maker/’flying saucer’ maker/toaster made by BAR-B-BUNS, Inc.
You see lot’s of the camping style around, but very rarely (if ever) do you see this electric version. 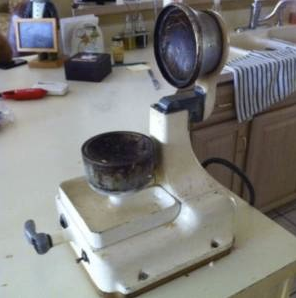 This unit has been in my family since the mid to late 1950’s, where my grandfather would make “flying saucer” sandwiches with his two daughters (my mother and my aunt). We suspect it was only made available to restaurants as it would have been secured to a counter top via 4 bolt holes (see pics). 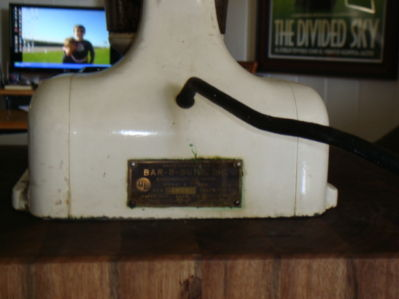 Here’s a chance to own some Real McCoy Americana. This unit is quite heavy: I estimate it to be around 30lbs. So that got us thinking. 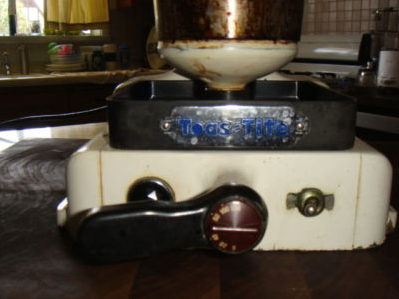 These two units were indeed Toas-Tite branded and produced by Bar-B-Buns in Ohio. We had to track down some additional information if we could. And that’s when the search turned to the patent library. After a bit of digging, we found Patent #2587314 filed on March 31, 1949 and issued February 26, 1952. The inventor was Mitchell A. 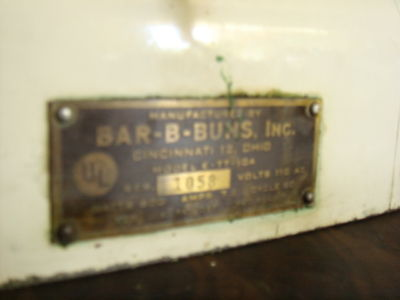 Hall and the assignor was Bar-B-Buns, Inc. 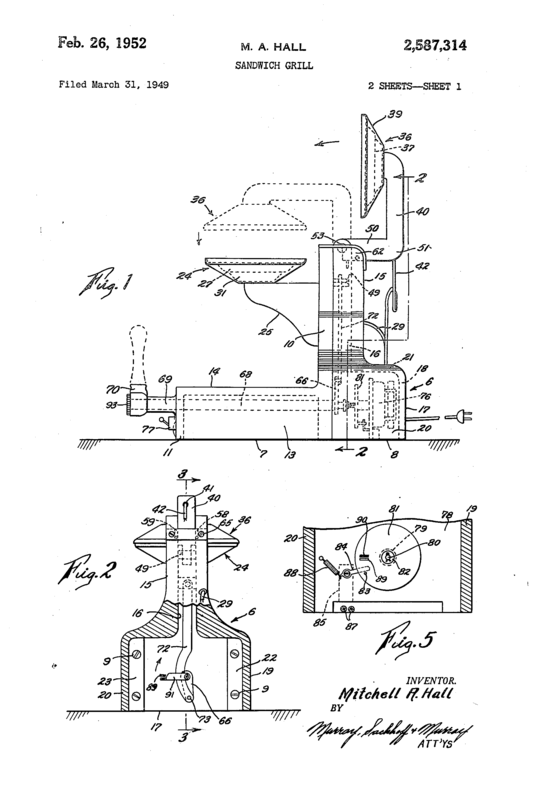 This invention relates to devices for making filled, toasted sandwiches, or the like, and is particularly directed to an improved mechanism for operating the heated, cooperating dies for devices of this character. The patent has a few references, including Patent #2463439 which is the original hand-held Toas-Tite grill patent by Strietelmeier. Assuming that the number on the back of the unit indicates the production number, we guess that at least 1058 of these were produced since that is the display number we made out in the Encinitas pictures. It also sounds like our very own Toas-Tite Recipes commenter Sharon Lucchesi has one. Sharon, if you’re still reading, we’d love to hear more about it and maybe even do a post all about your unit. 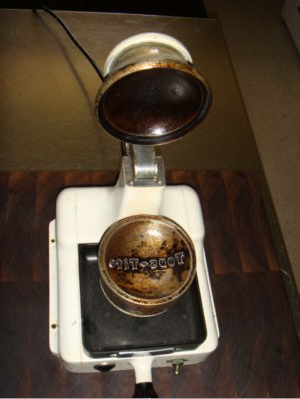 And if anyone else out there has one, write to us at boyandgirl@toastiterecipes.com. We can’t wait to hear from you too! We have an electric one with one small difference, ours has a sticker in back instead of the steel plate and no serial number. It says it is model ET1-10(?) The shape of the sticker would resemble a grecian style pool and is gold colored with red trim. Our story is similar to the other one. 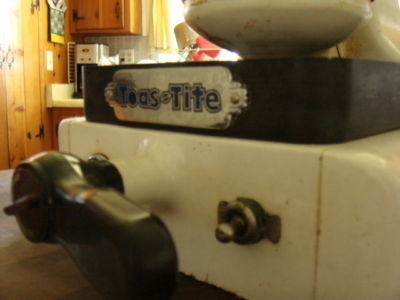 My wifes grand parents owned a restaurant and used the toas-tite there. We take it to work now and then and our co workers just love the sandwiches! Wow, we’ve never heard of that type before! This stuff is so exciting for us and we’d love to see a picture or two if you happen to have one available. You might have a one of a kind machine on your hands. Luckily with all the information we’ve received from Toas-Tite enthusiasts we’ve been able to piece together the history of the Toas-Tite universe! In my home town at the county fair there is a booth that has been selling sandwiches since the late 60 s they have 3 or 4 machines that make two at a time . I found out that they were used in a benders booth at the Seattle world’s fair I’m 1969 . 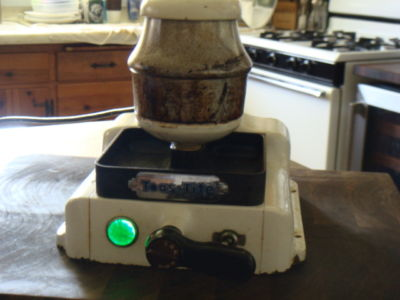 I have been looking for a machine like this for years .I have been using the manual models .do you know where to find them ? Wow, we’ve never heard of them being served at fairs before. So the first place to look would be they quite frequently have toas-tites for sale. But I would recommend that you buy an original toas-tite and not a replica toas-tite. They are easy to sort out, and if you go here to our how to buy page you’ll be on your way! My hometown of Lemmon SD had one. They called the burgers flying saucers. Just closed down last summer. I will never care to go back there now. I absolutely loved them. I want a machine sooooo bad. The restaurant that introduced us to Flying Saucers is “Sugar Shack” in Lemmon, South Dakota. While I didn’t get to spend a lot of time perusing their menu and decor (travelling with our two young sons), it was a retro-themed (ex. : LP albums on the wall) locally owned mom & pop burger & sweets place. The food was delicious. We heard about the place while visiting a Dinosaur museum in town… someone there told us about the “Flying Saucers” and my husband and I knew we just had to try them! Same place. My grandfather was the foreman on the job when the Petrified wood park was built. John Rafferty. I wonder if the owner is selling the machine separate. Yep same place… And how awesome that you quoted my post from way back on that super family vacation in 2008! 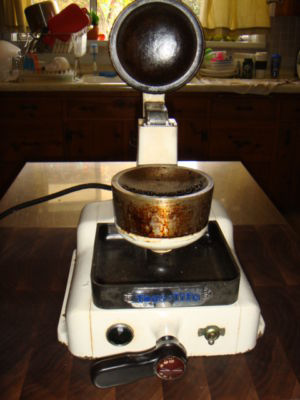 Since then Santa and the Easter Bunny have brought us 4 vintage toast-tires which we use regularly on our electric stovetop with great success. Our favorite tone to use them is when our boys have friends over for sleepovers and we introduce the friends to the most awesome cheeseburgers ever — toas-tites!!!! 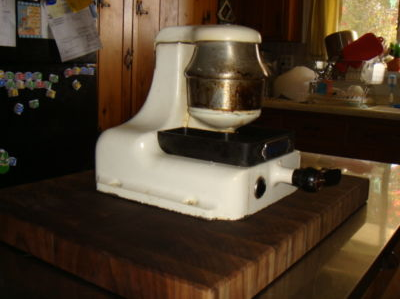 I have one… 🙂 My Mom bought it in the early 50’s and I could always go out and make a PB&J. I just made a cheese sandwich last night. and… the light is still shining bright! A real family treasure. I’m so jealous! 🙂 Hold on to it. Those are indeed a real treasure. 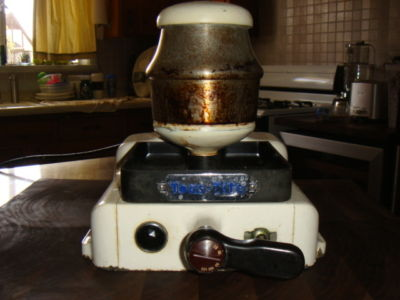 My mother owned a A&W in Muskogee,okla we had one of the machines. I have looked for one for many a year. If anyone would be willing to sell one. I would be interested.